These chicken skewers marinated in honey, lime juice and Sriracha are every bit as good as they look - and if you haven't tried Sriracha, the Asian hot sauce named after the coastal city of Si Racha in Thailand, this is the perfect recipe to taste just how delicious it is. This is my basic, go-to grilled chicken - perfect for a quick weeknight dinner or cookout - and so versatile. You can serve the fillets on their own (kids love them), topped with cheese on a toasted bun, chopped up in a quesadilla or, as I often do, sliced over a Greek or Caesar salad. Perfect for entertaining, these chicken thighs are marinated in a tangy Middle Eastern-style blend of Greek yogurt, lemon, garlic and spices, then grilled on skewers until golden brown. Serve with Basmati Rice Pilaf or on top of a Greek salad. Just be sure to make extra - the first time I made this dish for a crowd, I actually ran out of food! Classic Buffalo wings are fried but I love the flavor and ease of cooking them on the grill. They are truly no fuss, no muss and finger lickin' good! The key is to cook them over a moderate flame so that the fat renders out and the skin gets nice and crispy. I can't claim this recipe is authentic, but the spices - an aromatic blend of cinnamon, cumin, turmeric, ginger, paprika and coriander - make it taste decidedly Moroccan. The best part is that it only takes minutes to prepare, and there's barely any clean up. Margarita Chicken is one of those dishes that just screams fun. The marinade is a combination of tequila, lime, garlic and spices - and it's loaded with bright Southwestern flavor. Think of this dish as Chicken Teriyaki with a South Asian flair, or India meets the other flavors of Asia. It sounds exotic but it's actually kid-friendly and easy to prepare. Fajitas are easy to make at home and perfect for getting the whole family sharing everything at the dinner table. 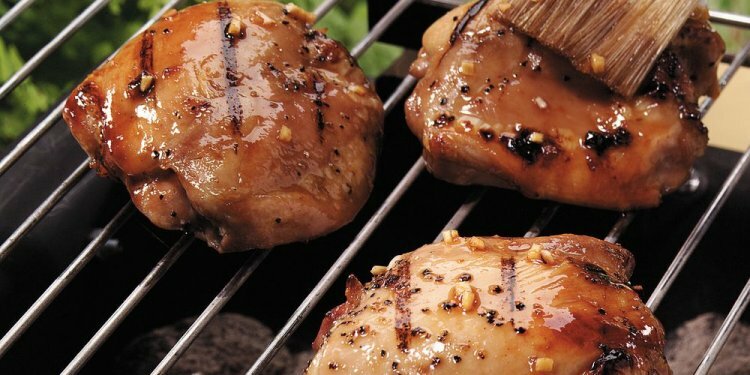 In this recipe, I marinate and grill the chicken for a smoky, charred flavor, and then sauté the onions and peppers on the stovetop until they caramelize and sweeten.